Spiders are small and big, much tough, hairy and just like insects so why aren’t they insects? 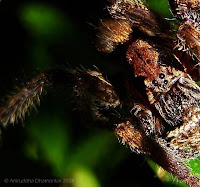 Well, spiders have eight legs and either six or eight eyes (every eye called an ocelli). Apart from these usual traits that make up a spider – they also have venom glands & fangs and spinnerets that spin webs. All these characters are typical of spider family and no insect possess these characters wholly although Spiders are considered distant relatives of insects. 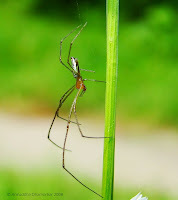 Spiders are therefore, unique and fall in the Class of Arachnida – which is shared by ten other odd creatures that roam the earth. To name a few – scorpions, harvestmen, Solifugids and Whip scorpions etc, out of which the Order of Araneae where spiders are placed is the most diverse with as many as 108 families! India has about 59 families, that’s about 54.6% of all. This diversity is undoubtedly rich and thriving. With large tarantulas such as Indian Ornamental Tarantula (Theraphosidae) to the small Tiny House Dwellers (Oceobiidae), we are lucky to share our backyards with these creatures. Lucky?! Someone may think, but yes, fortunate – for they are very much important to us as they are to the ecosystem. They keep your surrounding clean – eating the mosquitoes and other pests – and keep their population under check. 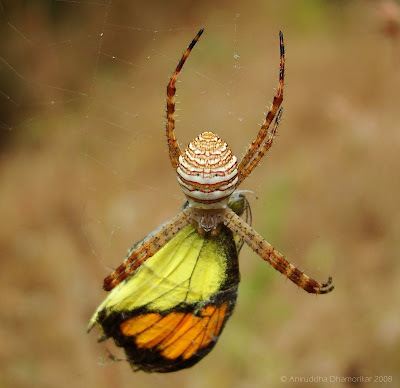 Surprisingly, they also feed on other spiders (most of the females feed on male spiders too!) thus keeping their own population under control! Albeit their commonness, they are yet less understood. Spiders have roamed this planet for millions of years, and have evolved into one of the supreme predators that exist. They hunt solitarily, and also in groups; they also use weapons and stealth for hunting. 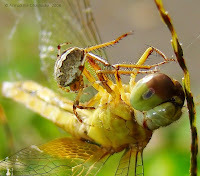 And besides being a good hunter, some even feed on plant matter such as nectar! These characters of the spiders are so overwhelming that scientists presume to discover more secrets about spiders. Apart from their morphology, they also hold great value and power in mythology. Spiders have been focus of fears, malice and painful death (for the possession of venom). They are said to have the ability to create their own world (actually, built by a web). An interesting myth about spiders would be the story of Arachne. The origin of the spider is the story of the weaving competition between the Greek goddess Athena and the princess Arachne. This fable was added much later to the Greek mythos when Ovid wrote the poem Metamorphoses between AD 2-8. Arachne was the daughter of a famous Tyrian purple dyer in Hypaipa of Lydia. Due to her father's skill with cloth dying, Arachne was adept in the art of weaving. Eventually, she began to consider herself a greater weaver than the goddess Athena herself and challenged the goddess to a weaving contest to prove her skill. Athena wove the scene of her victory over Poseidon that had inspired her patronage of Athens, while Arachne wove a tapestry featuring twenty-one episodes of infidelity amongst the Gods of Olympus, which angered Athena. The goddess conceded that Arachne's weaving was flawless but she was infuriated by the mortal's pride. In a final moment of anger, Athena destroyed Arachne's tapestry and loom with her shuttle. Out of sadness, Arachne hung herself soon after. Taking pity on her, Athena transformed her into a spider before the princess could kill herself. Athena made sure that the spider retained Arachne's weaving abilities. The Greek Arachne means "spider". 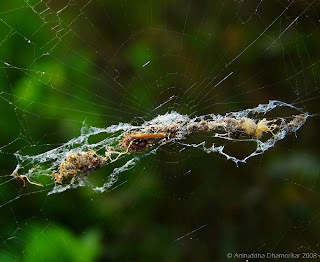 In the Vedic philosophy of India, the spider is depicted as hiding the ultimate reality with the veils of illusion. They have been here before our ancestors roamed this planet. They have captured the hearts of legendary empires and are at the heart of some legends. Let us treat them with some respect. A little space for them will only mean good luck to you, for every spider you kill; you invite bad luck towards you. In other words, a good population of spiders means a pest-free home! On a broader sense, a good population of spiders means a healthy ecosystem! 1. Huntsman Spider carrying eggsac. Spiders show serious parental care. 2. 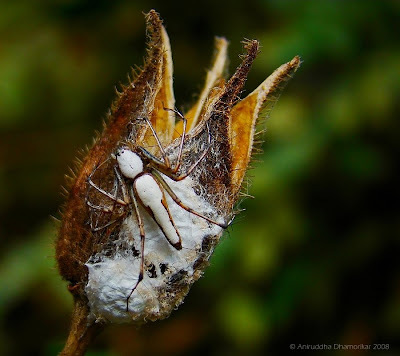 White Lynx Spider - O. shweta protecting its eggsac. 3. 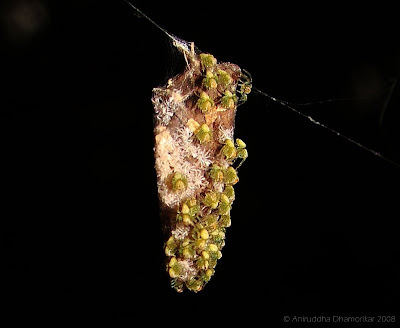 An unidentified spider protecting its eggsac. 4. The Spiderlings of the previous spider. Notice how they clutter together. They wouldnt leave the web for few days. 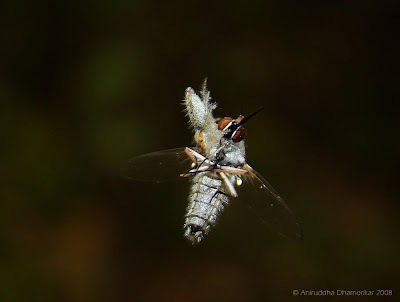 When threatened, they hang low from the "nest" and come back to the same position after a while. 5. 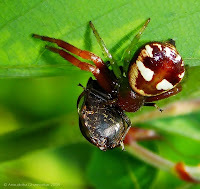 Cyclosa sp. 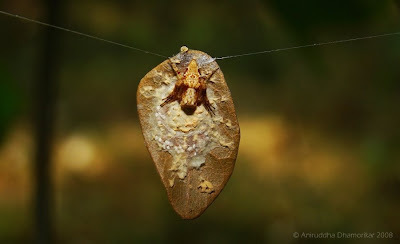 belonging to Araneidae, it is an Orb-weaver. Peculiar character would be collecting debri such as small particles, stamens, seeds, etc. and hiding between them for camouflage. The web of the Cyclosa sp. 6. 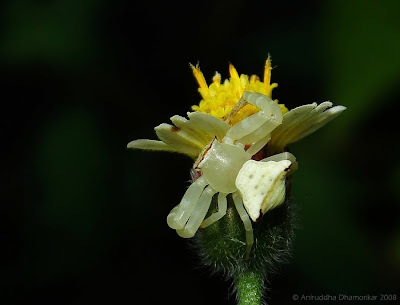 Crab Spider resting under Tridax inflorescence. Crab Spiders have excellent camouflage colours. 7. Signature Spider - Argiope sp. seen here feeding on Yellow Orange Tip butterfly. 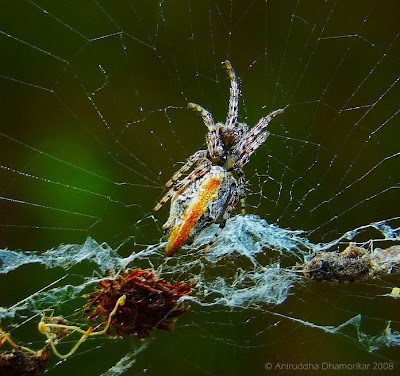 Spiders are master hunters and Orb Weavers have mastered the art of trapping prey in their orb-shaped webs. 8. 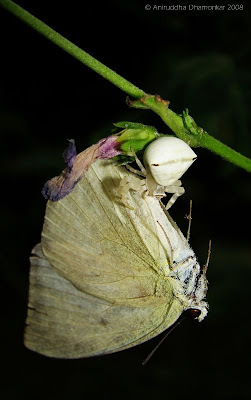 Crab Spider - seen here feeding on Common Emigrant. 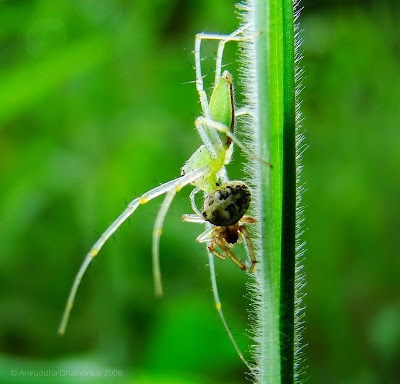 Crab Spiders are ambush predators. They await a prey (usually an insect) 'neath flowers and make a surprise attack. 9. Jumping Spider (Salticidae) have excellent eyesight. This spider (picture below) caught this fly as soon as it took off. The fly struggled enough to free itself but the spider was able to hang onto it - thanks to the strong fibre of the silk. 10. 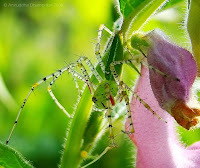 Green Lynx Spider - Peucetia viridians preying on Neoscona crucifera. Spiders do hunt other spiders, and may display cannibalism. Of course these are not the only ones seen around us. There are many more in fact a hell lot of them but this place is just too small to put 'em in. Came across this old rhyme online - "If you wish to live and thrive, let a spider run alive."